The Warehouse District, with its land-hugging, namesake warehouses, blaring train horns and cobblestone walkways, is one of downtown Raleigh’s most beloved areas, attracting architects and designers, beer and coffee brewers, chocolate confectioners and young entrepreneurs, artists and thousands of residents. The long-awaited, $80 million Union Station, when it opens in 2017, will cement the district as a transit hub and a cornerstone of the city. Land values will skyrocket—and, as developers have already noticed, there are still large swaths of property and old buildings ripe for redevelopment. 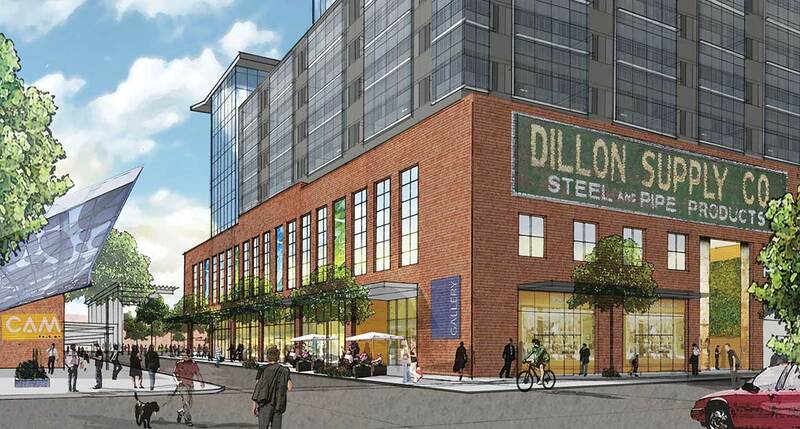 In late May, the city’s Planning Commission unanimously recommended that the City Council rezone the Dillon Supply Co. building—a historic, red-brick warehouse adjacent to the new Citrix building—as well as seven surrounding parcels, to allow for a mixed-use development of up to 20 stories. There are some restrictions: The ground floor must have what city planners call “active uses,” things like shops, small businesses, cafés, markets or art galleries; the developer has to include parking structures; and a portion of the site can go only nine stories high. To urban planners, this sort of thing makes perfect sense. As Raleigh planning director Ken Bowers points out, cities often encourage high-intensity development along transit lines to support transit investments and accommodate growth without adding traffic, as well as to create walkable places. But the people who live near the Dillon Supply building aren’t sold. In March, the Central Citizens Advisory Council voted against the proposal 17-1, with residents saying this project doesn’t mesh with what’s nearby. Currently, the tallest building in the Warehouse District is the six-story Hue apartment building. They also complained that the redevelopment doesn’t respect the district’s character and wouldn’t enhance public life or provide public benefits. And though Kane has promised to preserve some of the original brickwork, there’s no requirement that he keep the iconic Dillon Supply sign painted onto the building’s east side. This, too, bothers residents. Proponents counter that Kane is an expert at providing retail in public spaces—something everyone agrees downtown needs more of—and that the design will be urban and pedestrian-friendly, footsteps away from Union Station. They argue that the proposal is a strong example of healthy, transit-oriented development. Will Allen, a Raleigh-YIMBY founder, says he hopes the development, if approved, will in fact change the neighborhood’s character, at least to some degree. Howard, however, says that while he supports density “with design principles and conditions that respect the place,” this project is “a glorified parking deck,” with “dead space from the ground up, much of which can be floor after floor of unadorned parking garage.” He says condos, apartments and offices—not parking—should wrap the building. Thomas Sayer, an architect who lives and works in the Warehouse District, says the conversation about the Dillon warehouse needs to move beyond height. For Howard, the size of the redevelopment is important, but more so is preserving the Warehouse District’s character.